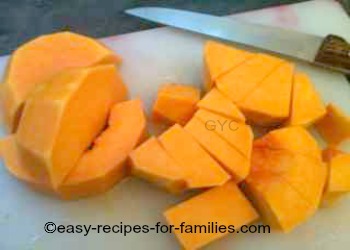 Here's an easy pumpkin soup from our collection of easy soup recipes. Like our other easy recipes, this dish takes minimal effort and yet produces a rich full flavored meal that'll have the family wanting more. 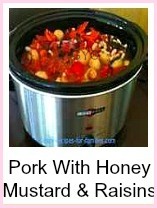 Yes, you've read right - just two steps - it's a one pot, throw it all in the pot type of recipe. 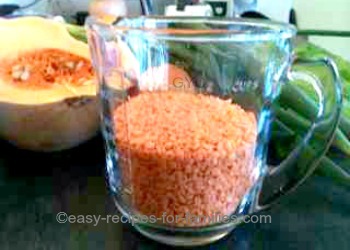 Here's the red lentils in a glass measuring cup. Rinse them in cold water discarding ones that float to the top or damaged or discolored ones. Toss them all into the slow cooker. Add the 8 cups of water. Here's all the soup ingredients tossed into the slow cooker. Look at how beautiful and nourishing it is. Now season the soup with stock powder, sugar, salt and pepper. Leave the sour cream and chives to the very last. 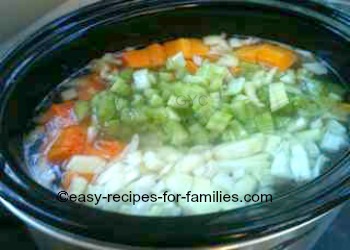 Cover with the lid of the slow cooker and turn it on to high for 4 hours or low for 6 hours. Walk away and just leave the soup to bubble away making a most nourishing and delicious meal. 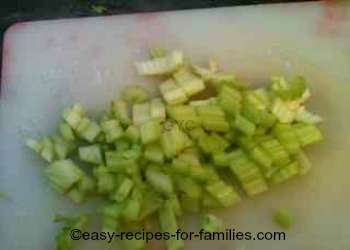 Just before serving, stir in the 2 cups of sour cream and the diced spring onions. 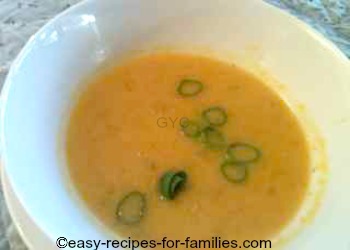 Using a hand held blender, blend the soup into a smooth homogeneous texture. But take care that the blades of the blender always remain below the level of the liquid, or you'll have soup all over your kitchen walls and benches! Whilst you don't have to attend to step 2, afterall, this soup is already perfectly delicious, the addition of sour cream and last of all fresh spring onions, adds richness and depth of flavor to the soup. Enjoy this delicious soup as a starters for dinner. It goes perfectly with a moist roast chicken, another super easy meal that you can walk away from, while it quietly roasts in the oven. The secret though, is to keep the roast moist. 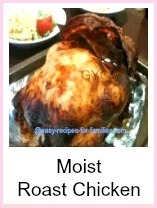 But don't worry, we'll tell you how to keep your roast moist and delicious. 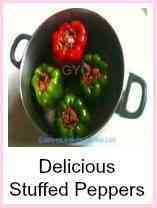 •	If you haven't yet already prepared the vegetables, do so now. •	Add the stock powder, sugar, salt and pepper and stir to mix it in. Here's the image, doesn't it look just so full of goodness and nourishment! 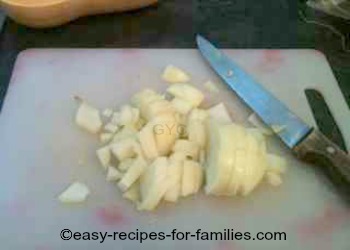 •	When its time to serve the soup, stir in the sour cream and spring onions. Now wasn't this a super easy soup? 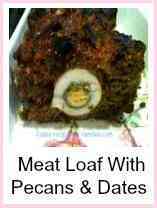 Like our other easy recipes, you'll find this meal so very tasty and healthy, yet it does not take much effort at all. Enjoy this delicious soup with crusty bread. When you use a blender, be sure to only have it operating when the blades are under the liquid, otherwise it'll spray food all over your kitchen bench and walls. You'll find this soup is even more delicious and even thicker if left for a day. Refrigerate any surplus and enjoy it the next day. 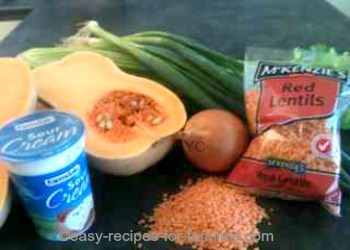 The lentils and pumpkin seem to absorb the full flavor of the stock resulting in a fuller flavor. Leave Easy Pumpkin Soup to explore the hundreds of delicious dinner recipes that will have the family running to the dinner table!